(Nanowerk Spotlight) OLEDs - organic light-emitting diodes - are full of promise for a range of practical applications not too far into the future. Today, OLEDs are used in small electronic device displays in mobile phones, MP3 players, digital cameras, etc. With more efficient and cheaper OLED technologies we soon will see ultraflat, very bright and power-saving OLED televisions, windows that could be used as light source at night, and large-scale organic solar cells. In contrast to regular LEDs, the emissive electroluminescent layer of an OLED consists of a thin-film of organic compounds. What makes OLEDs so attractive is that they do not require a backlight to function. Thus they draw far less power and, when powered from a battery, can operate longer on the same charge. OLED devices can be made thinner and lighter than comparable LED devices. Last but not least, OLEDs can be printed onto almost any substrate with inkjet printer technology, making new applications like displays embedded in clothes or roll-up displays possible. Unfortunately there are also drawbacks to this technology. Apart from its currently high manufacturing cost, the major problem is device degradation and the limited lifetime of organic materials. In particular, the most commonly used material for the anode, ITO (indium tin oxide), is a less than optimal material for future high-performance OLEDs. New research indicates that nanoimprinted semitransparent metal electrodes, replacing ITO electrodes, are an attractive and potentially practical solution for OLEDs and other organic devices. "Several aspects of ITO make it far from optimal for high-performance OLEDs" Dr. L. Jay Guo explains to Nanowerk. "It is known that the migration of indium and oxygen from ITO into organic semiconductors during OLED operation causes device degradation; the electrical properties of ITO greatly depend on the film preparation; the rough surface of the deposited ITO film and the work function of ITO limit the efficiency of the hole injection; moreover, the cost of ITO has escalated in recent years because of the jump in price of the element indium." Guo, an associate professor of Electrical Engineering & Computer Science at the University of Michigan, has come up with semitransparent metal electrodes, fabricated by nanoimprint lithography (NIL), that, with further optimization, could replace today's use of conventional ITO electrodes in OLEDs. The core findings of this research is that a nanowire metal grid can provide sufficient optical transparency and electrical conductivity for it to be used as a transparent electrode for organic optoelectronic applications. These metal electrodes contain no expensive metallic elements and do not suffer from atomic diffusion but are nevertheless very efficient. Guo tells the story how he first looked into this problem two and a half years ago with his former student Xing Cheng (now an assistant professor at Texas A&M University). "At that time" he says, "we were inspired by the widely publicized work of enhanced light transmission through silver film with periodic hole arrays, which were attributed to the excitation of surface Plasmon wave. We wanted to apply this finding to OLED displays by providing a different way of creating a colored display through the surface Plasmon resonance and at the same time produce high optical transparency." "Xing Cheng did fabricate the first set of electrode samples, but the transparency was not very high, partly due to the fact we didn't’t optimize the structure. Later on, I decided to pursue a simpler approach without using surface plasmon resonance, which is to make as much as opening as possible in the metal electrode, without seriously compromising its electrical performance. This has led to our current work." ("Nanoimprinted Semitransparent Metal Electrodes and Their Application in Organic Light-Emitting Diodes"). Previously, several alternative materials, for example, TiN, Al-doped ZnO, and fluorine tin oxide, have been investigated as anode materials instead of ITO; however, none are optimal as anode in OLEDs because they have either a lower work function or a lower conductivity than ITO. Other transparent conducting oxides do have a higher work function and a similar electrical conductivity when compared to ITO but they are potentially problematic because they also contain the element indium that may diffuse into the organic layer in the OLED and also has a high price, making these electrodes expensive. 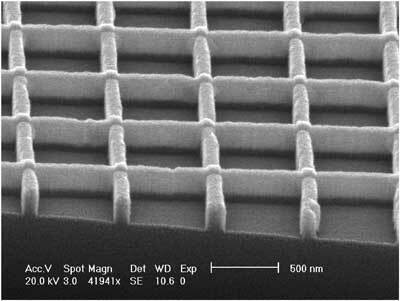 Guo and his team based their new electrodes on a densely perforated thin film of metal supported on a glass layer. The perforations make the metal layer almost transparent, which means it can be the top electrode in an OLED. Moreover, they can fine-tune the fabrication process to make the perforations smaller or larger and to change their spacing. This allows them to adjust the transparency at different wavelengths of light allowing different colors to predominate. Most importantly though, NIL can be used to make an electrode with an enormous area, far bigger than a cellphone display, and so open up OLED technology to a much wider range of applications, including windows and giant screen TVs. Guo explains that, although the optical transparency and the electrical conductivity can not be totally independent of each other because conductive materials naturally absorb light, his approach can decouple the two aspects to a large extent. "We have shown that, by using nanowire of different thickness, we could increase the conductivity three-fold while the optical transparency is only reduced by 5%. The other advantages of our approach are the flexibility of these metal mesh structures, which are more compatible with flexible substrates, and the potential of fabrication cost reductions by using common metal materials." Guo and his team demonstrated working OLED devices by using metal mesh electrodes made of different metals, including copper, which is very inexpensive. "We believe this new electrode structure could also help solve another big problem in ITO-based OLED displays, which is the light trapping in the ITO layer due to its higher refractive index than the organic materials" says Guo. "This currently results in less than 25% of the generated photons to actually come out of the device and become useful." It also might be possible to integrate polarizer functionality with the metal wire electrodes to achieve polarized light emission. This will benefit LCD based displays by providing simpler structures and reduced fabrication steps. "We are in the process of optimizing our electrode designs" Guo explains the team's current efforts. "In fact there is a lot of room in the parameter space so we could design appropriate structures for different applications. We are also exploiting such new electrode structures in organic solar cells to replace ITO, and our initial results are very promising. With these important applications, and by further reducing the fabrication cost, the commercial prospects should become clearer in the near future."